We invite healthcare professionals, designers, patients, developers, innovators, students and entrepreneurs to take part in building useable solutions to frontline healthcare problems. 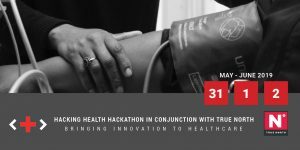 Join us Friday, May 31 to Sunday, June 02 for Hacking Health Waterloo’s Hackathon in conjunction with True North taking place at Kitchener City Hall. Our hackathons are a fun, hands-on, intense, 3-day hackathon that breaks down barriers to healthcare innovation in Kitchener-Waterloo. Our goal isn’t just to organize hackathons, it’s to have a long-term impact on our healthcare system. This hackathon in conjunction with True North will take place simultaneously in Ottawa and Kitchener-Waterloo. We can’t wait to see you contribute to a hackathon project that can be brought to market for the benefit of communities everywhere – we have the resources to help you get there! Social Isolation, Aging, and Technology is our theme for this dual-city hackathon. Social isolation affects many people, particularly the aged, and links with the Tech for good theme for the True North conference. The hackathon aim is to break down barriers to healthcare innovation by bringing together healthcare professionals, IT, designers, policy analysts, students, patients and entrepreneurs to collaborate, dream up & create solutions to real-world problems to improve healthcare. Read about the basics of Social Isolation here. These basics will help you frame the inspiration for your project. We understand that you are excited to solve problems but please refrain from developing the solution before the Hackathon. Feel free to ideate, design, post, update, review, join a project on Sparkboard once you’ve registered! Hacking Health Waterloo is powered by an incredible group of sponsors. We’d love to have you join us! Take a look at our sponsorship package if you are interested in sponsoring our hackathon.